The What Would Jesus Eat Cook Book by Don Colbert, M.D. Since I talked about What Would Jesus Eat last week and happen to own the companion cook book I thought I would foray briefly into food blog territory for this week’s post. The What Would Jesus Eat Cook Book began with a brief introduction in which Colbert listed ten steps to help his readers change from their “typical American way of eating to a Mediterranean way of eating” (ix). Many of the steps were similar to advice offered in What Would Jesus Eat. These included eliminating processed food, using olive oil in place of other oils and fats, avoiding fried foods, limiting meat intake and exercising regularly. Colbert altered his advice on wine in the cook book version and suggested that his readers enjoy a glass of wine per day (in What Would Jesus Eat he recommended wine substitutes). Colbert also added a prescription to “make dining and experience you enjoy with others” (x). Enticed by the two hundred pages of recipes that followed I decided to make Ezekiel’s Bread, the only recipe that also appeared in What Would Jesus Eat. And, in keeping with Colbert’s ideal of dining as an experience, I brought a loaf of Ezekiel’s Bread to share with my book club. The recipe for this bread is based on a story from the book of Ezekiel. Ezekiel was a prophet in the time of the Babylonian exile who responded to many of God’s requests in order to convey messages to the exiled Israelites. Colbert explained that in one such instance “God said to Ezekiel, ‘Also take for yourself wheat, barely, beans, lentils, millet, and spelt [rye]; put them into one vessel, and make bread of them for yourself’ (Ezekiel 4:9)” (85). Ezekiel was commanded to eat this bread every day for a year, and Colbert noted that it is a “complete-protein mixture” with its combination of wheat and beans. Although the recipe for Ezekiel’s Bread appears in both What Would Jesus Eat and in The What Would Jesus Eat Cook Book, the recipes are different. When I saw the recipe in What Would Jesus Eat, I was interested but intimidated. The recipe in What Would Jesus Eat called for the use of a flour mill which I do not own and I am not quite an expert enough baker to get around this missing tool (the recipe can be found on pages 86-87). Luckily, the cook book version called for pre-ground barley, soy, millet and rye flour instead of the raw ingredients. I halved the recipe because the original makes 4 loaves of Ezekiel’s Bread which seemed unnecessary (and I only have two loaf pans) but the full recipe appears below in case you feel inspired to feed the multitudes. This is a dense and satisfying bread. 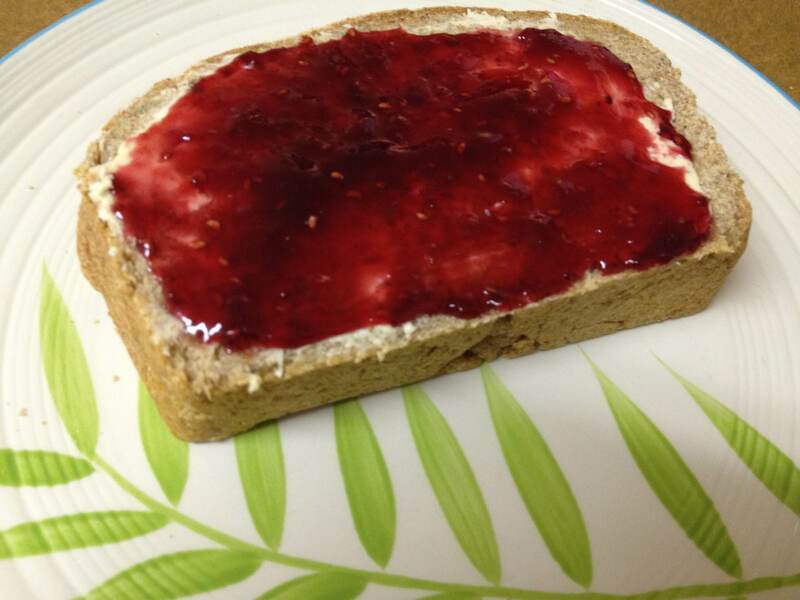 I served this with butter and honey at book club and enjoyed a piece at home with raspberry jam. Both versions were excellent. From The What Would Jesus Eat Cook Book, Page 59. Stir the yeast and 1 tbsp honey into the 1 cup warm water and let stand for 10 min. Place the whole wheat flour, barley flour, soy flour, millet flour, and rye flour in a large bowl and stir to combine. Combine the lentils, olive oil, the ½ to ¾ cup honey, and ½ cup of the water in a blender, process until smooth. Combine the lentil mixture and the remaining 3 ½ cups water in a large bowl; stir until well mixed. Stir in 2 cups of the flour mixture. Add the salt and the remaining flour mixture. Knead until smooth on a floured board. Place in an oiled bowl and let rise in a warm place until doubled in bulk [about an hour]. Divide into 4 equal portions. Shape each portion into a large loaf. Place in greased loaf pans. Bake at 375 degrees for 45 minutes to 1 hour or until bread tests done. This entry was posted in Uncategorized and tagged Bible, don colbert, Ezekiel, Ezekiel's Bread, food, recipe, religion, what would jesus eat by Adrienne Krone. Bookmark the permalink.